Jayant Kripalani is hard to nail down. When he talks wistfully about being knee-deep in water fishing for trout in his mountain hideaway, he seems about to wax philosophical, and then he just shrugs it off, shifting into ‘chill’ mode. Cool is what best describes him, easy going, and unpretentious. 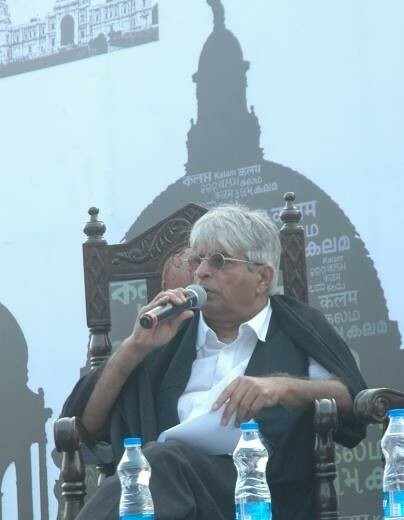 We caught up with him at the Kolkata Literary Meet where he had been asked by the organizers to dramatize excerpts of his book, New Market Tales, ambitiously planning for the affair to take place at New Market itself. New Market is seldom bare, as one familiar with Calcutta, would know. Hence, the scale of humanity in evidence at the Kalam event simply would stir the blood – if there was any room. A triumphant Jayant, back from his day of sparkling success at New Market was a joy to chat with. We hope you enjoy his antics. P.S. Notice now he is quick to quip about every politician except West Bengal’s rather humourless CM, who famously had a Jadavpur University professor dragged away in cuffs due to his circulation of a cartoon featuring her. Nice play, Jayant! It is quite clear that you want to come back to the city of your birth without any a hitch.